Hadrian's Cavalry would have carried long swords and spears to attack their enemies. Cavalry soldiers needed longer swords than infantry soldiers. This was so they could reach their foe. This type of sword developed from Iron Age examples in Europe. 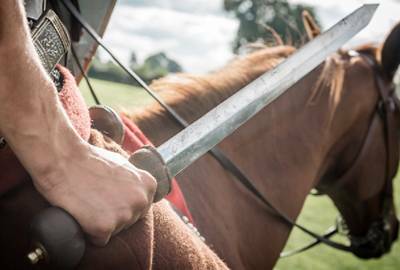 The Roman Cavalry sword called a spatha would have been held in a scabbard, made from leather or wood. Usually all that remains is the chape, the protective fitting that covered the tip. Most of a shield would be made of wood. The shield boss, the raised central part of a shield, was usually made of metal. Its original, practical purpose was to protect the hand holding the shield. Some bosses were elaborately decorated to project a message about the owner of the shield. They were also used as a way to invoke the protection of the gods. This broken cavalry sword is still razor sharp, complete with nicks in the blade. It is one of the finest examples to be found on the frontier of Roman Britain. 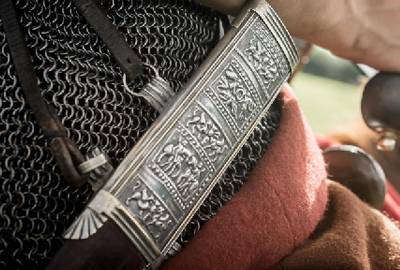 The sword was discovered among the foundations of a building dated to AD 105–120. This was before the construction of Hadrian’s Wall. It may have been owned by a cavalryman from Spain. The boss is decorated with the head of Medusa surrounded by figures of Mars, Hercules (holding his club), Jupiter, Apollo (accompanied by a leopard) and Bacchus. To the left is a Roman cavalryman riding down a Dacian tribesman. The boss has been damaged in battle, probably during the Dacian wars of AD 101–2 or 105–6. The outer part is decorated with shields, armour, a helmet and flying Victories holding inscriptions. These are written in Latin but use Greek letters. The top inscription attributes the shield boss to Marcus Ulpius, a member of the Imperial Horse Guard during the time of Trajan. The second inscription appears to record Flavius Volussinus giving the boss as an offering in memory of Marcus Ulpius. This is the only surviving item of military equipment owned by a named member of the Horse Guard. "Cavalrymen have long swords so we can reach the foot soldiers. We could also stab with our spears, or even throw them at our opponents. We learn to attack in formation to look more impressive. 30 men, a turma, charging at once could easily defeat foot soldiers."